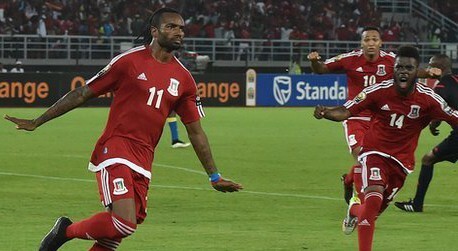 Despite the abundance of resilience and determination that Equatorial Guinea had showcasing throughout their odds defying AFCON campaign, even at half time against Gabon it still seemed likely that an absence of genuine quality would ultimately consign the hosts to being categorised as mere plucky losers. That Javier Balboa – the figure always most likely to provide the National Thunder with the spark they were crying out for – endured a largely frustrating half only added to that perception, with the Estoril man’s most notable contribution in an exasperating performance being the wasting of numerous dead ball situations. The second period however saw Balboa rise to the occasion in dramatic fashion. With the half still in its infancy the former Real Madrid trainee burst into the Gabonese penalty area and was critically upended by Lloyd Palun – Balboa arguably went down easily but contact was undeniable. Balboa dusted himself down in readiness to take the penalty, yet the connotations involved meant this was no ordinary spot kick – score and Equatorial Guinea would move to the cusp of the most implausible of quarter-final appearances, however miss and the hosts would be dealt a potentially terminal body blow. Bata held its breath, yet anxieties were soon transformed to ecstasy as Balboa slammed home. From that point on Balboa proved a consistent outlet, as rather than resting on their laurels Equatorial Guinea pushed for a killer goal. Their perseverance paid dividends, as Balboa – composer once again – played in Emilio Nsue and although his shot was saved Iban was on hand to swallow up the rebound. On a historic night, Equatorial Guinea could point to any number of heroes, yet there is little denying that without the orchestrating skills of Balboa the hosts might have been left with feelings of pride doused in disappointment rather than the elation that infused upon the full time whistle.